There’s something new from Tiny Owl Knits: The Woodsy Association. 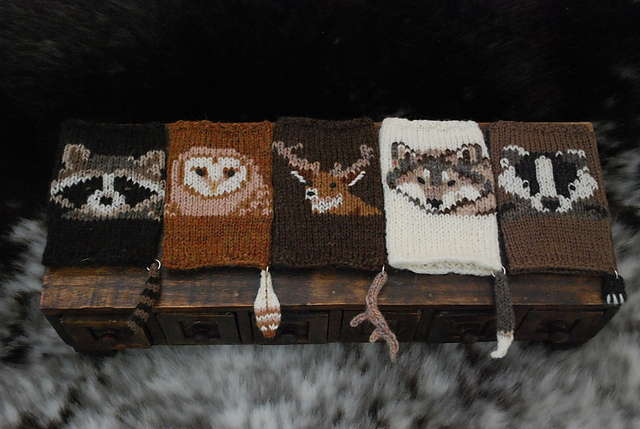 In her usual whimsical fashion TOK has created a whole forest of wrist warmers. Their little tails are clearly the best part! It’s been a while since our Tiny Owl Knits KAL and I bet Amanda already has a couple of pairs of these bad boys on the needles. A little sock yarn will go a long way with these, they are a petite knit and I’m guessing they are pretty addictive. This pattern comes just in time to kick off that knitterly/crafting season that is fall. Knitters have to be on the ball to get a few things accomplished before December. Start now people! This entry was posted on Tuesday, October 23rd, 2012 at 10:23 pm	and is filed under Uncategorized. You can follow any responses to this entry through the RSS 2.0 feed. Both comments and pings are currently closed. An absolute must knit now that I’ve finished knitting my dog!